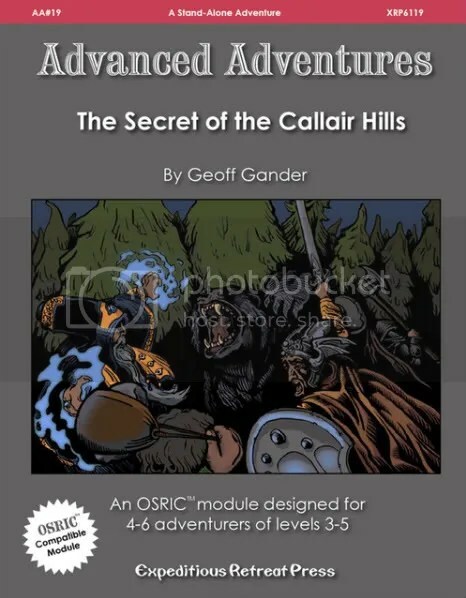 Advanced Adventures #19: The Secret of the Callair Hills PDF now on sale! My latest roleplaying game adventure module has officially been released by the great folks at Expeditious Retreat Press. It’s exciting to see my work out there, and I hope the gaming community has as much fun playing it as I did writing it! The Callair Hills are a true frontier region. Bounded to the east by impassable mountains, to the southeast by dark forests, and to the north by goblin lands, these windy hills are largely cut off from more civilized realms. If it were not for the rich veins of silver that lie close to the surface here and the passable soils, this region would have been entirely ignored throughout history. The Tunnelers has been out for a few weeks, and it’s available on a number of websites (which I’ve included below). But as an author my job has just begun. Now, of course, I need to get the word out! If my work was hardcover or paperback, I could do a lot of my promotional work by arranging book signings at local bookstores or other venues. Even if I didn’t make a lot of sales, the fact that I would be sitting at a table, surrounded by stacks of books, might attract people’s attention and the resulting conversations might generate a few indirect sales. But my book is an e-book, so there’s nothing tangible for potential customers to flip through. Fortunately, the technology that let me send my manuscript to the publisher can also help me advertise it. There are quite a few bloggers who, if interested in an author’s work, will review it for free, and some of these sites have a considerable number of followers. Some reviewers will also post their reviews on Amazon or other sites, in addition to their own blog, which in turn will generate more visibility. Needless to say, I’ve approached a number of them already, and there is interest. I’ve also searched local websites for community portals related to my genre (horror), and made contact with them. If things go well I’ll increase local awareness of my book, and make links to other writers in my community. Finally, I’ve contacted my university alumni magazine to post a notice about my book, and I’ve contacted the student newspaper – never underestimate the power of the alumni community. Although these are only first steps, the feedback I’m getting from them is encouraging. Forward momentum, no matter how small, is always better than sitting around waiting for something to happen. And if nothing else, the connections I’m making are valuable in themselves. Simon Royle’s Indie Reviewers listing – a collection of sites that will review your work for free if they’re interested – a great first stop. A mentor of mine once told me that when writing a story, it’s essential to show, and not tell. This means presenting the information or action in a story such that the reader sees what you mean, rather than describing what happens in a detached manner. This brings the reader deeper into the story. “So you want out, after only one night?” Raimonds leaned back in his chair, studying Andrejs over steepled fingers. He turned back to Andrejs and narrowed his eyes. “You know, boy, you’re quite lucky that I like Daina. If you had been recommended by anyone else, there’s a good chance your body would be floating in the river about now. But I trust her, and if she says someone is worthwhile then they must be good for something. “So here’s what I’m going to do. I’ll let you walk out of here with your life, your night’s wages, and the memory of the great opportunity you refused. Keep that in mind as you toil away for nothing, or more likely return to your hovel in despair.” Raimonds snickered loudly, and was joined by the other people in the room. Guntis smirked and folded his arms across his broad chest. “I’ve pounded people bigger than you into the dirt for much less, kid, but you’ve got guts to say that here. Either you’re real mad, real crazy, or brave. Whatever you are, you’re funny, so instead of beating you up I’ll play a game with you,” he pulled a shiny gold coin out of his pouch and flipped it into the air. His hand darted out and caught it, and he held it out for Andrejs to see. “I’ll bet you a gold lats – you know what gold is, don’t you? – that you’ll be back here in less than a month. I’ll even stake your wager, if you want.” He snickered and wiped his nose with the back of a meaty hand. “Alright. I accept your wager. I won’t come back, and I won’t need anyone’s help. Come see me in a month, and then I’ll take that gold from you!” Andrejs held out his hand, which Guntis sauntered over and shook. His grip was like iron. So, after an hour’s work, I’ve not only provided a clear reason for Andrejs’ anxiety in chapter 2; I’ve also deepened the antagonism between Andrejs and Raimonds and his cronies, and given Andrejs a character flaw (overcompensation for the loss of his father, which forced him to be a surrogate father to his siblings at a relatively young age). This will clarify some aspects of the conflicts in future chapters, as well.